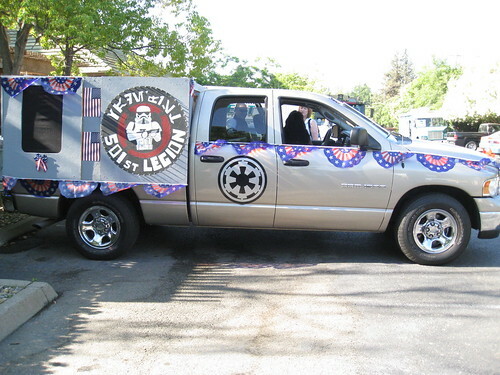 Mark has invited Endor Base to join the Central California Garrison for a holiday parade. The garrison parade vehicle will be used at this event. The Central California Garrison and Endor Base braved 35+ mph winds and chilly temperatures to participate in Sacramento's Santa Parade last Saturday. Since it was a Christmas parade, we all wore some type of holiday decorations like santa hats, elf hats and reindeer antlers. Myke and I were asked to be judges for the best decorated CCG member. We all warmed up once we started walking. Eugene lost a decoration and had his santa hat fly off and I had my hood whipping me in the face due to the wind but we finished the parade unscathed. I was amazed that there was a decent turn out of people watching the parade and of course there were lots of kids excited to see their favorite Star Wars characters. Here are a few pics from my camera. Mary and I by the garrison parade truck. Myke and Eugene dueling by a fountain. The gusty wind was my only complaint. I witnessed a 4 year old kid getting knocked over by the wind. That had to be confusing for the poor little guy. Thanks for posting those picture Eugene. I like how there are some landmarks in the backgrounds like the Hard Rock, convention center and the capitol. I didn't see the kid get knocked over, but I'm not surprised! I felt it push me along a few times while we were walking. By the way your Maul costume looks fantastic!